While you may associate cable railings with modern homes, many clients with log cabins and rustic-style houses request cable railing systems. Because many log cabins are built in the mountains or on lakes, they tend to have impressive, natural views. Cable railings seamlessly blend with their surroundings and don’t obstruct your line of sight, making them perfect for log cabins. In addition, they require very little maintenance which is great for summer or vacation homes. For inspiration, take a look at some of our completed cable railing projects for log cabin homes. Supported by fieldstone columns, this spacious deck wraps around the front of this log cabin on Liberty Lake. Because the home is surrounded by a vast forest, the homeowners wanted the deck railing to preserve the natural view. They opted for our Keuka Style cable railing with “Raven Black” powder-coated steel posts and a wood top rail that matches the home’s exterior. Deep in the mountains of Montana, this concrete log cabin has a breathtaking panoramic vista. To make the most of the secluded location, the homeowners wanted to create a living space on the rooftop over the garage. Keuka Studios crafted a Keuka Style cable railing for the rooftop as well as the exterior decks and interior balconies, catwalk, and staircases. For their octagonal contemporary log cabin, our client in Washington wanted a cable railing that would blend right in with the surrounding pine tree forest. To match the decking and the natural colors of the forest, the homeowners chose green powder-coated steel posts and a wood top rail. 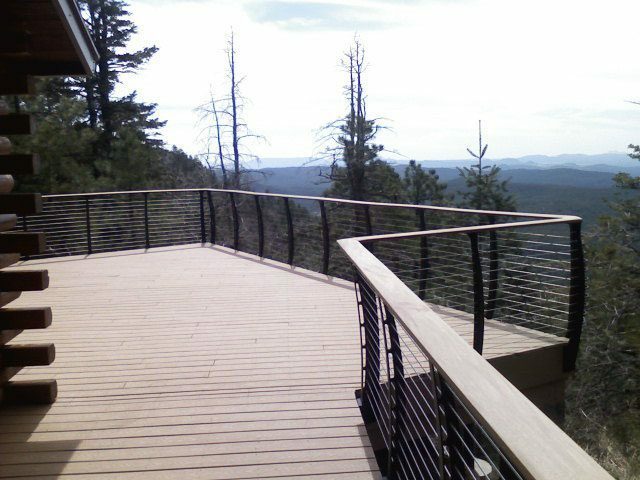 In order to preserve the 360 degree views, our clients selected our slender Ithaca Style railing posts. This rustic home has an endless view of the snow-covered Montana mountains. 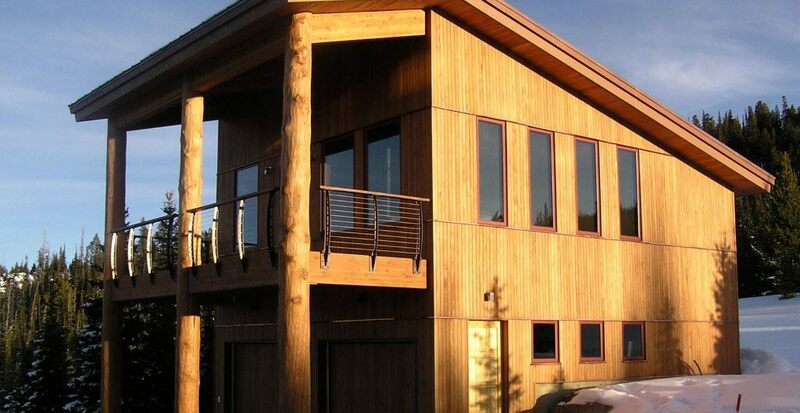 It features a log timber deck with thick wood poles that extend from the ground to the second-story roof. To match the timber, our clients requested a cable railing system that resembles bronze. We designed a custom Keuka Style railing with “Oil-Rubbed Bronze” powder-coated steel posts, a wood top rail, and bronze cable infill. Not far from Saguaro National Park, this log cabin has a sizable deck that looks out at a cascade of mountains. For the deck, Keuka Studios designed a cable railing system with a wood top rail and “Raven Black” powder-coated steel posts. With its curved posts and simple style, the Keuka Style railing fits perfectly with the log cabin exterior. As a result, the log cabin’s exterior has a natural and cohesive appearance.